The château de Malmaison, purchased by Josephine in 1799 was, together with the Tuileries, the French government's headquarters from 1800 to 1802. 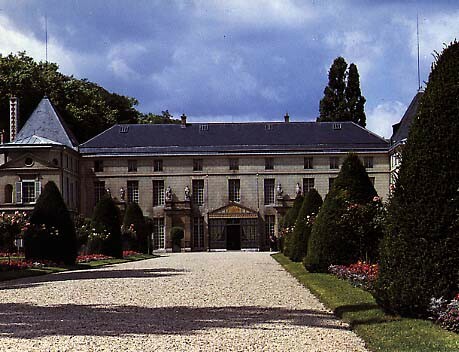 When Napoleon moved to Saint-Cloud, Josephine stayed in Malmaison and commissioned a wide range of improvements to the house. She settled in permanently after her divorce in 1809 and died there on May 29, 1814. On returning from Elba, Napoleon visited Malmaison as a place of pilgrimage and stayed there a few days before being exiled to the island of Saint-Helena. In 1861, Napoleon III set up the first museum of the Consulate in Malmaison. It closed in 1870. After many trials and tribulations and breaking up of the estate in many smaller pieces, the château was donated to the State in 1904 by the philanthropist Daniel Osiris and the museum re-opened in 1906. Entirely redecorated in an antique style by Percier and Fontaine in 1800, the château contains a remarkable panorama of art of the Consular period. Visitors enter the building through a porch in the shape of a military tent which opens into the main hall. Passing through the billiard-room, visitors enter the “Salon Doré” where hang two paintings by Gérard and Girodet illustrating the myth of Ossian. The music room, which is currently being restored, contains a few paintings belonging to the now dismantled collection of Josephine, as well as her harp and Queen Hortense's piano. The dining room with its harmony of subtle colours, is a perfect illustration of Pompeian style. The counsel chamber is made to look like a military tent and the library – whose magnificent original decoration has been preserved – contains furniture which was mainly brought from the Tuileries. A secret staircase led Napoleon directly to his rooms on the first floor. As for Napoleon's rooms, the drawing room contains many portraits of members of the imperial family. His bedroom is furnished with items brought from several imperial residences. The next rooms in the visit contain some exceptional items, such as David's dramatic painting of “Napoleon crossing the Great Saint-Bernard pass“, the First Consul's ceremonial sword and the table-top from the table at Austerlitz, on which the Emperor and his marshals are represented. Amongst the Empresses rooms, there is her extraordinary red and gilt room in the shape of a tent with the bed (designed by Jacob Desmalter) in which she died. The visit ends on the second floor with the room devoted to the Josephine's court trains. Visitors can enjoy a walk in the park which was transformed by Berthault. Inside the park is a rose garden created by Josephine and a summer pavilion restored to its 1814 condition. and then take bus n°258; get of at the "Le Château" stop. By car: RN 13, parking spaces opposite the château. Weekdays 10 a.m. to 12:30 p.m. (last entry at noon) and 2 p.m. to 5:45 (summer) or 5:15 (winter).